Few things in life are as utterly predictable as the evangelical circus, as some pieces I read this week show. Former Mars Hill Church senior pastor Mark Driscoll has filed incorporation papers in Phoenix for a new entity called The Trinity Church in Arizona, 14 months after he resigned his Seattle pulpit and just under a year after Mars Hill ceased to exist. The new entity will be a “Bible-based Christian church” with Driscoll and two other directors, each giving the address of Mark Driscoll Ministries in Phoenix. Driscoll and his family moved to the “Valley of the Sun” last summer. …On Nov. 30, 2015, Driscoll and two associates incorporate[d] The Trinity Church in Arizona. Driscoll has been back on the evangelical preaching circuit and has early new year appearances at the Zion Conference in Texas, the North Valley Community Church in Arizona and the megachurch-hosted Most Excellent Way to Lead conference in South Carolina. Driscoll is also blogging, lately with an eight-part series on the meaning of Christmas. I’m all for second chances, but this one was a no-brainer from the start. Do you think Driscoll and crew moved to Phoenix because one day he learned about the legend of the phoenix rising again out of the ashes to live forever? Do you think he’s gonna be working that into his bio? Do you think maybe he has been reading feng shui Master Lam Kam Chuen’s description in The Feng Shui Handbook? A mythical bird that never dies, the phoenix flies far ahead to the front, always scanning the landscape and distant space. It represents our capacity for vision, for collecting sensory information about our environment and the events unfolding within it. The phoenix, with its great beauty, creates intense excitement and deathless inspiration. Excuse me if my excitement is not intense and my inspiration bit the dust at this news. It’s just so predictable. Will the hymns be by John Williams? Liquid’s “Cosmic Christmas” services began last Sunday and will conclude on Christmas Eve with a live Star Wars Nativity Scene. Guests will be invited to line-up for their opportunity to wield a lightsaber and join the Nativity with Leia, Han Solo, Chewbacca, and R2D2, according to a press release from the church. …In a break from tradition, the church will tell the story of the birth of Jesus through the book of Revelation – the last book in the Bible. Kenny Jahng, media pastor at the church, said the use of Star Wars characters allows the church to draw a line from something familiar, in this case Star Wars, to the biblical story. This family-friendly event culminates in a message of hope that tells the story of Jesus’ birth in a way you’ve never heard before! The event is FREE…but TICKETS ARE REQUIRED. Space is limited…please fill out a campus form below to register today! Register during the “12 Days of Star Wars Christmas” starting on December 6th and get automatically entered to win awesome Star Wars prizes! If you didn’t see this coming, you don’t know evangelicalism. Christianity Today ran a couple of major circus stories this week, one of them about yet another wave of Multi-Level Marketing companies becoming popular among Christians. Shaklee or Amway, anyone? The businesses that made many of us uncomfortable back in the 1970s and 80s are back with a vengeance. And the evangelical church, especially its women, are signing up more than ever. In some ways, the church is a perfect setting for MLM sales. Many companies were founded by Christians or have explicit Christian values, including Mary Kay (cosmetics), Shaklee (nutritional supplements), Pampered Chef (kitchen equipment), Premier Designs (jewelry), and Advocare (sports performance). “Because direct-selling is relationship-based, and of course the church community is so relationship-based, that definitely is a draw,” said Monroe. Further, MLM allows Christian women to engage business, community, and family at once, in a way that the current work–home divide doesn’t allow for, at least not as seamlessly. Many women want to work and raise a family without the demands of a 9-to-5 job. In a 2012 Pew Research Survey, US mothers said their most desired work scenario would be part-time; working moms wish they were home more, and stay-at-home moms wish they could work outside the home. This makes a “work-from-home” arrangement such as MLM attractive—especially to evangelicals, who are more likely than any other religious group to say it’s better for the family when one parent stays home. “As long as MLMs are regarded by conservative Christians as a more honorable option for women than a normal part-time or full-time job, these organizations will continue to attract women within the church at significant rates,” says Jen Wilkin, a minister at the Village Church in Flower Mound, Texas, where she leads a citywide women’s Bible study. What the MLMs don’t tell you however, according to CT, is that fewer than one percent of sellers in them earn a profit. In one company the article profiles, more than ninety percent of recruits stay at the lowest level, earning $600 or less per year. And that’s not the only problem. For years, these kinds of companies have been on the FTC’s watch list for fraud, deceptive claims, unfair pricing of their products, and operating as pyramid schemes. In terms of Christian relationships, the article accurately attests to the awkwardness that can grow in communities where people want to love and support each other, but feel conflicted and uncomfortable when they are pressured to buy or join up. Beyond personal discomfort, some churches have found this kind of “pitching in the pews” troublesome for the health of the congregation and potentially schismatic. Nevertheless, this piece reports a resurgence in MLM, especially among evangelical Christian women. With a church that tends to view life in consumeristic, transactional terms (and, in my opinion, doesn’t adequately value the contributions and gifts of women), we oughta see something like this coming pretty easily. A Saturday Ramblings kinda vibe to the writing here today. 1) Mark Driscoll. I already feel sorry for the people who enter his black hole gravity and get sucked in. Lord, please help them all be more like you. 2) Star Wars Cosmic Christmas Eve. Someone has gone to the Dark Side. 3) MLM and Christians. Lord have mercy. I think MLM and Evangelicalism have a pretty long history. But I wonder if it is so much Evangelicalism or that they are both common in the same space (middle-class white suburban). There was a *lot* of MLM at the mega I used to attend; it matched very well with the pro-business/entrepreneurship[-sort-kinda] culture. I think it is spot on that this is like a business-lite that house wives can participate in [although it is often more play-acting at business than it is a business]. I have wondered why house wives don’t pursue more remote work as a revenue source; certainly they could do copy-editing, code review, etc… and get actually $$/hr. Many of the house-wives at the mega had college degrees, but no professional experience – having gotten married during or **immediately** following college. Makes perfect sense. Evangelicalism expects you to spiritualize your personal networks “for the Lord”. After all, “ninety percent of conversions stem from the witnessing of recent converts”. In MLM-land, you are expected to monetarize your personal networks for profit. And MLM-land is infamous for “Revival Meetings” to keep the suckers low on the list involved in the con. Amway even adds Christianese to the mix. Jesus is My Upline, aggressively pitched to the Christianese set. But only the Uplines at the top of the list get the big bucks. Big bucks contributed by all those suckers Downline trying to become Uplines. > Star Wars Cosmic Christmas Eve. Just the thing for Quiverfull Christianese Mom to bring in pin money (at least if she’s on top of the pyramid list) without having to risk going outside of her CHRISTIAN home. Grandma used to send us Shaklee all the time. Those were my vitamins and protein shakes growing up. Re: MLMs. What the woman mentioned in the article may not know is that the 2 largest MLM essential oils companies are Mormon-run and the marketing materials contain all sorts of odd and unBiblical theology such as: God put his intelligence in plants which is why these companies especially fine essential oils “know” just what your body needs them to do. Remember Mormonism ceased to be a CULT CULT CULT when Romney won the GOP nomination in 2012. A Star Wars Christmas sounds like a whole lot of copywright infringement going on. Does that thou shalt not steal thing not count anymore? A church is almost certainly safe as a derivative work [provided they don’t actually show the movie(s)]. My more troubling question is – where did they get the money? Somebody chose to fund *this*? That makes me sad. I know just barely enough about Intellectual Property law to get myself in trouble, but this doesn’t seem to me to be obviously true. There are areas where derivative works can slip through. Recall “The Wind Done Gone,” in which the lawsuit by the Margaret Mitchell estate was defended on the grounds of its being a parody, in the legal sense of a work that comments on or criticizes a prior work. The case settled out of court, so we don’t know if that argument would have stuck. But you can’t just use, say, Mickey Mouse in a cartoon and invoke “derivative work” when Disney comes after you. Which raises the interesting question of whether they will in this case. On the one hand, going after a church has bad optics. On the other hand, this is Disney we are talking about! On a different note, I am surprised that an Evangelical church is so accepting of the Eastern mysticism woo woo of “the Force.” Do you suppose they simply didn’t notice it? 1) Denounce it as Satanic, specifically “Eastern mysticism woo woo”. This was the Party Line of Calvary Chapel from Papa Chuck himself (who seemed to have an obsession with denouncing Star Wars). And from a private message board I’m on, Option 2 is again seeing a workout. But how can it possibly be stealing if they are only taking what belongs to the Lord in the first place? And besides, if it’s good for us then your property rights are obviously subordinate to the cause. Isn’t that how it works? “Souls” (not people), the currency of Heaven. All about the (spiritual) Benjamins, baby. Star Wars Christmas was tried back in the 80’s… just keep the Ewoks out of this one, please! Behold, a young Jon Bon Jovi sings “R2D2, We Wish You A Merry Christmas”. STAR WARS HOLIDAY SPECIAL, 1978. Mark Driscoll is back. Seriously, did anyone NOT see this coming? A blind man in a pitch-black cave could have seen this one coming! The man has been living off of celebrity pastoring for practically his entire adult life, he left his old church via the back door (ducking out of the repentance and restoration process *his own hand-picked men* requested of him), and has been dropping hints online of a resurgence ever since. It was never a question of if, only when and where. Who didn’t see this article coming? It was just a matter of time. It’s what we do and why? Not a whole lot different when you get right down to it. After all, We all become some kind of judge when we get right down to it. Got to go to work and none of this will change my day. Yes, of this, without hesitation. And more than a few MLMs have experience with the robed kind of justices. That Star Wars church finds funding does make me a bit sad. Mr. Driscoll, … meh, that was as certain as the rising of the sun. Any fool willing to follow him has had plenty of warning about what will happen next – rinse, repeat. Who didn’t see this comment coming? The inevitable complaint about judging… and round and round we go, sometimes high, sometines low. Thank you. Now I have to get to work. Making my point KK. Oh well…. hard enough day but there’s always tomorrow it’s only a day away. Oh wait it will have enough troubles of its own. Haven’t heard from you in a while, w. How are things? Car accident can’t hardly use one knee. Walking the mountain all but gone. Where I did my praying. No insurance besides I couldn’t take the time off work for it to heal. Sometimes I have to stay in bed all day with ice on it so I can beat it up the next day. Knee it is. I lay tile floors. This week 1650 Of wood plank tile floor on cement board good money but when it goes completely numb not in a good way I kinda feel like getting out of here. I’ll wait and see he has never left me down yet. Sorry but you asked. I am sure things must be better for you and hope they are. Do those things that like in lifting they are so up lifting. Dr. you have got my attention more than once. Very sharp and that’s a compliment. Maybe you’ll see it maybe you won’t. Keep on. I’ll see you someday I hope. Really…..
As I was working on the 1650 I wore a hole in my hand and everywhere I put my hand down there was a spot of blood. Needless to say there was probable more than a thousand spots of blood on the floor. It’s okay this has always been my life. My hope is you continue with what you are doing especially with lifting and give me a report now and then because it brightens my day more than you could ever realize. You being a special person when it comes to lifting all it does is make me smile and gives me a little hop in my step…….for real. You could start now really I could use it a lot right now………..God bless and I mean it with all I have. I’m having my troubles right now and could use some good news. And now back to our original story (that doesn’t involve Driscoll, Ewoks and Amway)…. 7 days til Christmas eve. 7 themes for prayer. My soul proclaims the greatness of the Lord. Your last line. I need that. A lot. All of what you have written is goodness. The root of Jesse thing is powerful. Direct-selling? Isn’t that where people pressure the people they know to buy stuff they don’t need, and leverage the closeness of their relationships as a selling tool? Doesn’t it work on the same principle as taking your kid’s charity fund-raising candy bars to the office, and using guilt, shaming and soft social pressure (which can be pretty hard) to unload the stuff on your co-workers? “Kenny Jahng, media pastor at the church . . .” MEDIA pastor? Is that even a thing? Sheesh. Yes, they shepherd the media! Again… this gets funded [someone gets paid for that]. Sad. If you have that much spare money you cannot decide what to do with give me a call, I can connect you with some people. MEDIA pastor? Is that even a thing? Sounds more Spiritual than Propaganda Minister, PR Flack, or Spinmeister. Star Wars-themed church service… by pastor Tim LUCAS. The exact same thing jumped out at me. People, you can’t make this up! I can’t believe I gave up an opportunity to preach the Star Wars gospel last Sunday! Instead, I proclaimed the gospel from Luke 2.1-20. I pity all those poor souls damned to hell because I gave the wrong message! When will Episode VIII come out? I want to be sure and get it right this time. 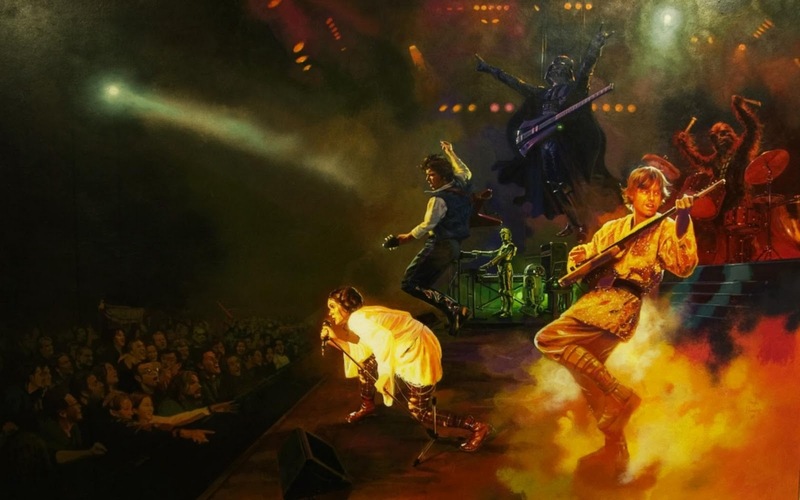 The worship leader over there is Larry Chewbacca. No joke. Churches I grew up in hated Star Wars. It’s all eastern mysticism and gateway to demons. And me reading the books and loving the video games were idols in my life and I needed to rededicate myself to God. The worse part was they convinced my mom to get rid of all my Star Wars toys. This was early 90s when it was all the original action figures, and I had dozens, including ships and holders and trading cards. The church put the idea into her head that my childhood nightmares were the result of me watching Star Wars (to be fair, I used to hide from Darth Vader) and playing with the toys, so they had to go. At a garage sale. All of them for a buck. Worth hundreds if not thousands at the time. We still “joke” about it every once in a while, and she realizes it was wrong to do lol. Parents do their best. I’ll be going Tuesday to see the new Star Wars and marathoning the old trilogy this Saturday! I wonder if unconsciously I developed more of a collector’s mindset because I one day came home to find all my favorite toys utterly gone. For my own good. So I subconsciously started hoarding. Possibly. Lol. That sounds familiar. All my GI Joes gone, because they were making me violent. Yep. Because little boys need small man-dolls to make them violent. The “O Antiphons” are a good antidote to this nonsense. Look them up. Who for our sakes have appeared on earth as a man? and we offer You a virgin Mother! O Pre-eternal God, have mercy on us! the many gods of idolatry were destroyed. and the nations came to believe in one sovereign Godhead. When You, our God, were made man. Great is Your mercy, O Lord, glory to You! but heaven spoke through a star and proclaimed You to all, O Savior. have mercy upon them and upon us! has shone to the world the light of wisdom! and to know You, the Orient from on high. O Lord, glory to You! and the earth offers a cave to the Unapproachable One! Angels with shepherds glorify Him! since for our sake the eternal God was born as a little Child! A connection that probably doesn’t come immediately to mind, but which, when you think about it, makes perfect sense: Vladimir Putin, Donald Trump and Mark Driscoll are all cut from the same cloth. This struck me as I noticed an article on the BBC news page right before I clinked on today’s Monk. In it, Vladimir Putin expresses his respect for Trump, describing Trump as “a very outstanding person, talented, without a doubt.” It takes one to know one, I guess. I suspect that if Putin was familiar with Driscoll, he’d say much the same thing for much the same reason. It will be a savage irony if the long expected and dreaded anti-Christ turned out to be an amalgam of Putin/Trump/Driscoll. The mark of the beast? Perhaps a haircut that looks like an overweight chinchilla. Oddly, the people most interested in over-confident, authoritarian personalities are evangelical-types. As to multi-level marketing (MLM). . .
was to market motivational rallies and sell motivational books and recordings. Possibly. It is impossible to make money in MLM through sales; you make money by recruiting. My area is inundated with women selling 31 purses and bags. It’s ok stuff, but honestly, nothing better than I could buy at Target for less money. I think it points to the fact that Christians have got to be the most naïve group of people when it comes to marketing. Slap a Bible verse or some Christian saying on a product and voila! Ready made marketing to the evangelical set. It’s a faith company, right? So, there’d be no price gouging, or using under paid workers, or anything like that, right? I can TRUST this company. It’s Christian! There is a church with the name of Liquid Church near us. Must be a franchise church. Re MLM in the church. In a non-denom church I served in for 12 years, we had to make an explicit rule that you couldn’t use the church facilities to host product parties. Because women who had keys to the building were coming in (especially on Saturdays) to host their jewelry, Pampered Chef, etc. parties. And they were passing around their sales catalogs on Sunday mornings. This was sowing a lot of discord, both among those who felt pressured to purchase and those who felt left out when they weren’t handed a catalog… and felt they were thus somehow second-class friends. What a mess this stuff brings. To me, this is akin to another evangelical phenomenon, that of the “unfunded mandate” method of financing ministries, mission trips and parachurch staff. Not having grown up in the evangelical subculture, I was shocked the first time I realized individuals were expected to go out and solicit funding for these sorts of things from their friends, neighbors and fellow congregants—rather than paying for them out of pocket or the church itself funding them in its budget. I always felt angry whenever I received the “ask” letter. I always gave out of guilt, but I was very resentful at being used in this way. I was doubly resentful when the person worked for IVCF, Campus Crusade, or another parachurch organization. Why were they not salaried? Once I pledged to a person in ministry like this, and ever after I felt tremendous guilt to keep it going for years. Finally I cut off all giving for these sorts of things, as well as for people in MLM enterprises. They are terrible abuses of friendships and a terrible way to get ministry done. One woman did both Mary Kay and shaklee. It was commonplace to be hit for a sale in the parking lot after church to the point of irritation. However, complaining was futile because these women were usually the deacons / staff members wife or the church saw the extra sale as a 10% tithe / commission opportunity. That, along with other reasons, was a good reason for leaving that church.